Sibling Photos: A Dapper Dude and a Baby Blossom! We have been really excited to get these sneak peeks up on the blog of “a dapper dude and a baby blossom”! 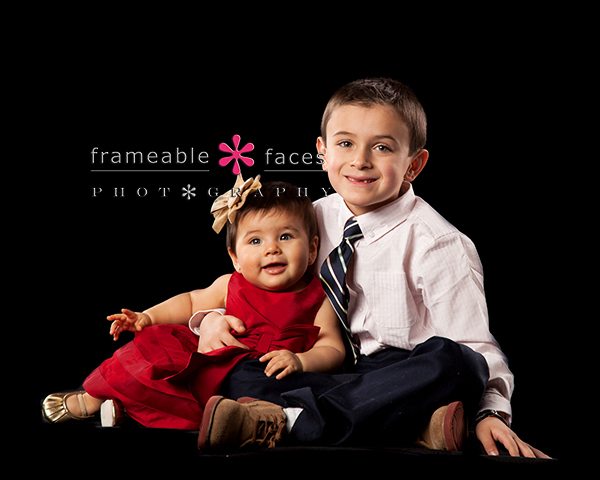 Such a precious session with these little siblings and they were a total pleasure to work with. Very sweet and well behaved, they followed instructions like champs! We started off by getting some photos of the two of them together on the white background. 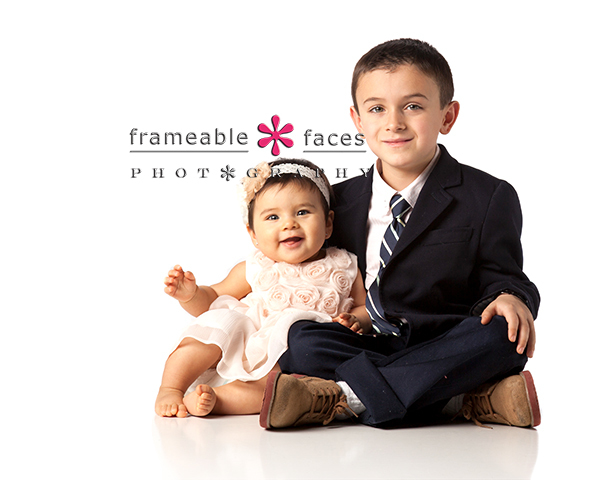 Our dapper dude was styling with his sport coat and tie and his little sister was looking pretty in pink with the flower headband and flowery dress. Flowers were definitely a strong theme for this session and if you have been a regular here on our blog you probably can guess where we are going with that…. The white always looks great – nice and simple and can be displayed pretty much anywhere. Next we moved to the black background and the kids changed up their look a little. We love the red dress in particular against the black – it just pops and both brother and sister are beaming! Big brother looks really proud and happy to be with his little sis! 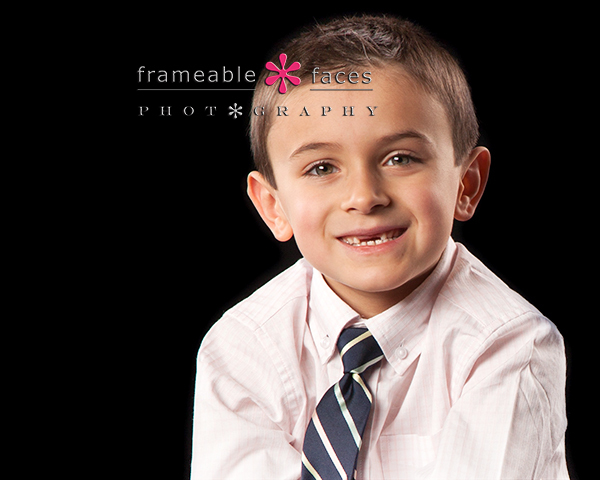 Next we gave our dapper dude a moment in the spotlight for himself… That smile! 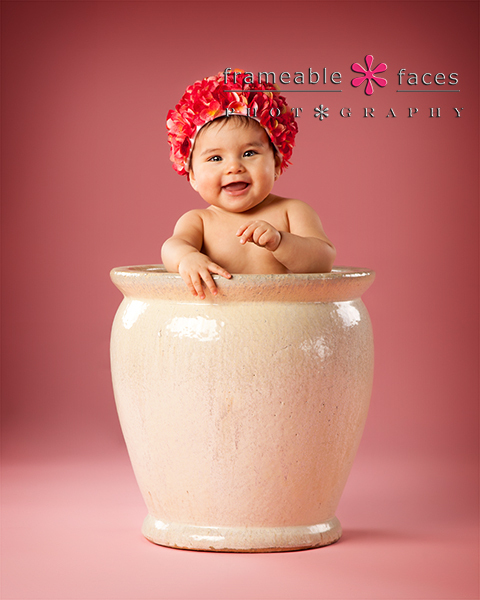 Needless to say we never get tired of the flower pot babies. How could we? These make us smile every time and the little ones always seem to have a lot of fun being in the pot while everyone is smiling laughing and cheering for them! They are perfect for right around the 6 month milestone or slightly after as long as they are sitting up. All in all we had a really memorable time with our little friends and their mommy and grandma here at our studio! We hope these made you smile too! Liked it? Take a second to support Frameable Faces on Patreon! Jessica’s Sublime Siberian Senior Session! Sierra’s Spokesmodel Session Had Glamour AND Grit! A-lovin’ Havin’ Alivia Represent Frameable Faces As A Spokesmodel! Boudoir And Bold: Kathryn Katches Fire! Katie Krushed Her Spokesmodel Studio Session for the Class of 2020! Doin’ The Spokesmodeling Thing For The Class of 2020 With Dana! Senior Spokesmodeling With Sedona to Kickoff The Class of 2020! Reflecto is our snarky and sometimes-rogue on location reflector. Follow on twitter!